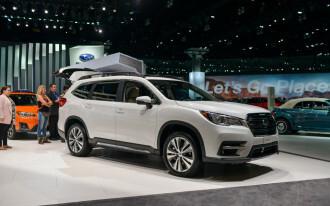 The new 2019 Subaru Ascent does family duty like Sunday chores. 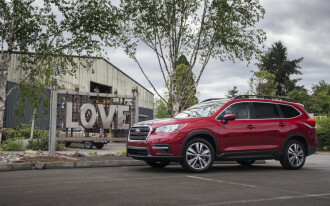 It's the biggest consumer vehicle Subaru has ever made, and as we found during our first drive around Portland, Oregon, it's clear that it's here to stay. 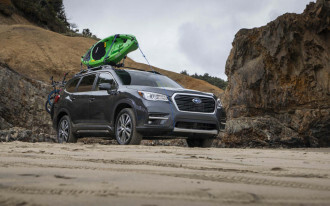 The 2019 Ascent skips the unfortunate, vacuum-like looks of Subaru's older three-row crossover with surprising style and versatility. (It's easy to throw shade on the B9 Tribeca because of course it is.) 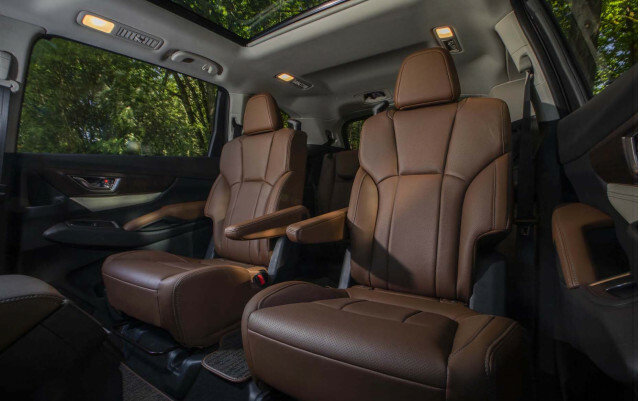 The Ascent is just as big as a Honda Pilot with just as much room. That's not the only surprise from the big Subie. Here are six things we learned about Subaru's newest crossover. Parents already know: Car seats are less fun than diaper blowouts. 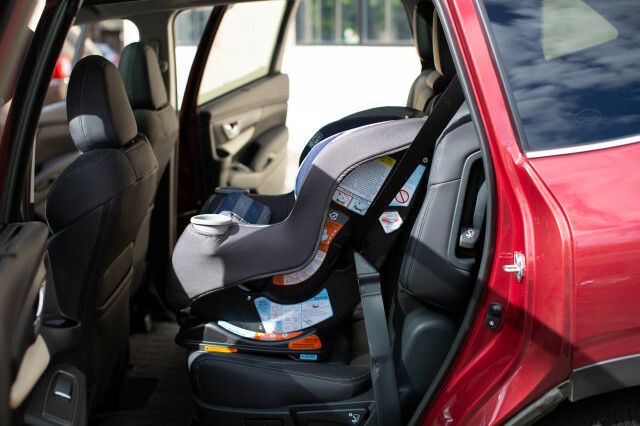 The Ascent's rear doors open wide (up to 75 degrees) to help parents fit small children in rear- and front-facing car seats—especially useful with full hands. A rear-facing car seat can fit in the second row with a full-grown adult sitting ahead of it, and two front-facing seats can fit on the same side in the second and third rows. We even managed to squeeze an adult into the third row without removing a front-facing seat in the second row—no easy task—and that's useful for a full brood of little ones. 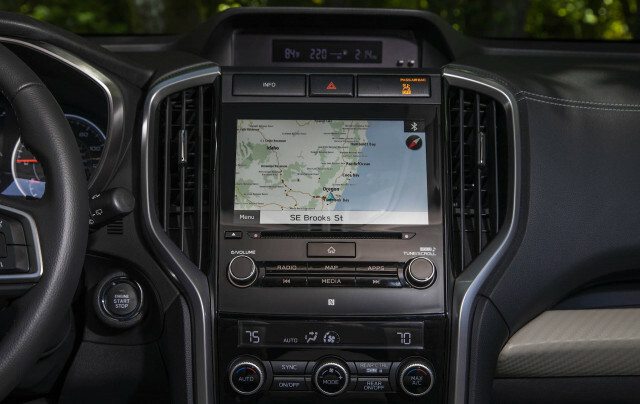 Premium and higher trim levels get Subaru's 8.0-inch Starlink infotainment system, improved from prior iterations. Including Apple CarPlay compatibility and telematics that can help emergency responders find the vehicle after a crash, the system has another ace up its sleeve: it can pinch to zoom and swipe naturally like a smartphone. That may seem like small potatoes, but it's a relative rarity among infotainment units. Subaru's Starlink has potential. 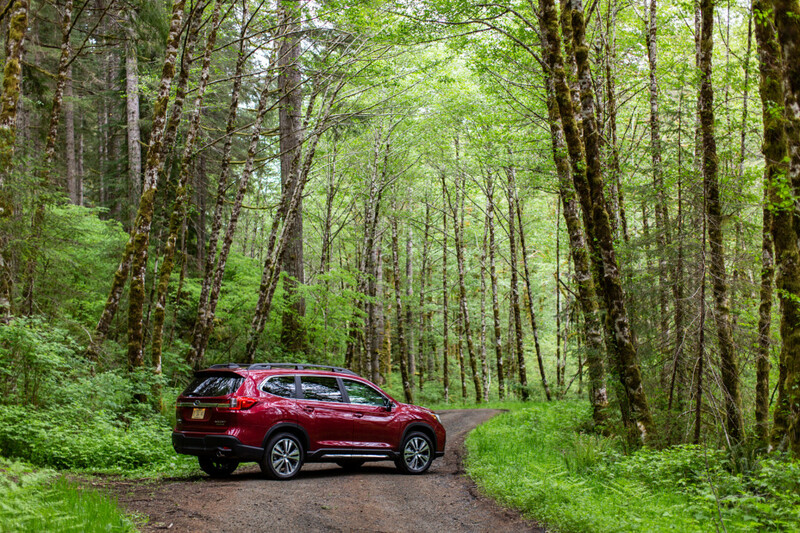 The 2019 Ascent won't be confused for a luxury car anytime soon, but it's not for a lack of trying. The plain jane exterior belies a surprisingly refined interior in top trims. 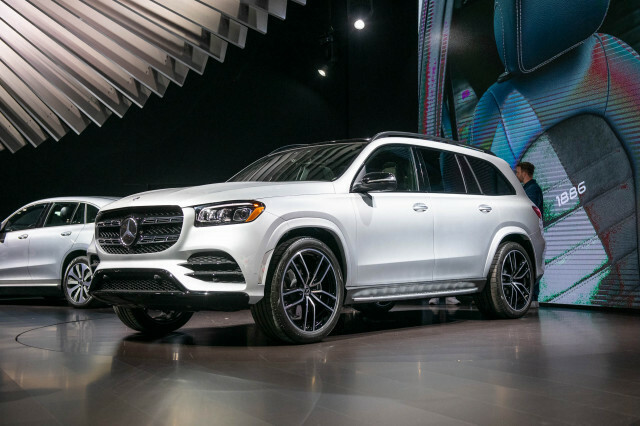 Touring trims—the top of the pile at roughly $45,000—sport soft hides, premium audio from Harman Kardon, three-zone climate control, a dual-pane sunroof, eight USB ports scattered throughout three rows of seats, a quiet interior, 20-inch wheels, and a 180-degree forward facing camera. The same kit in a BMW X5 runs up the score to nearly $70,000. 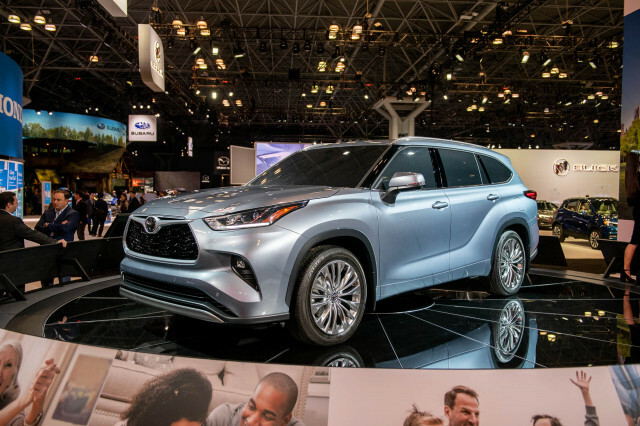 The 2019 Ascent sports a new 2.4-liter turbo-4 that's rated at 260 horsepower and can tow up to 5,000 pounds, with trailer stability assist. That last figure won't need a correction. 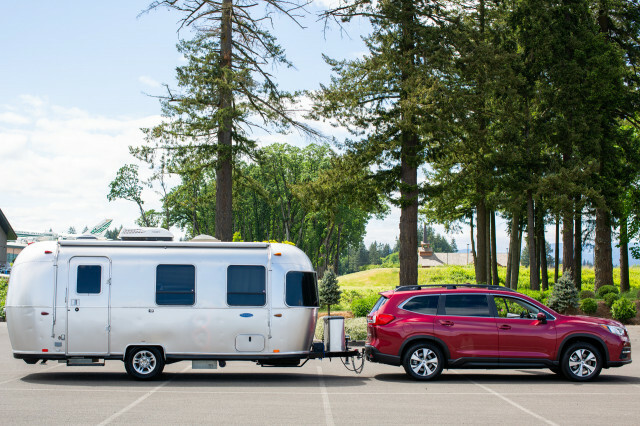 We dragged a 4,300-pound Airstream trailer around an Oregon parking lot without much fuss. Unlike some unibody crossovers, the Ascent doesn't squat much with that much weight to the bumper and it adequately accelerated through a slalom course. 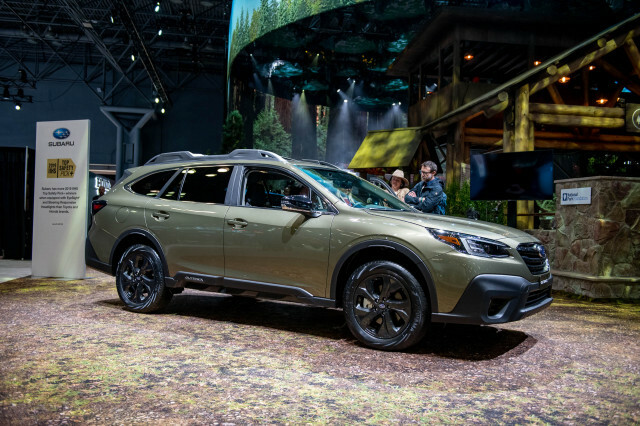 With standard all-wheel drive and an off-road drive mode Subaru calls X-Mode, the Ascent powers through rutted trails and beginner two-tracks without much fuss. 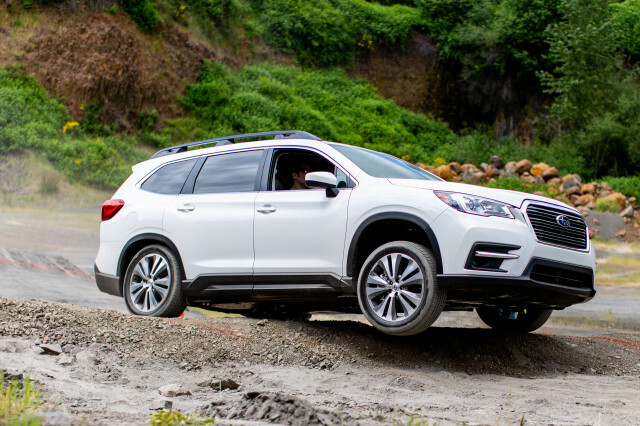 The Ascent boasts the same ground clearance as the Subaru Outback and Jeep Grand Cherokee—8.7 inches—both of which have earned the off-road merit badge before. We don't imagine many full-size families will hit the Rubicon Trail in an Ascent, but getting closer to the lake campsite is a breeze. 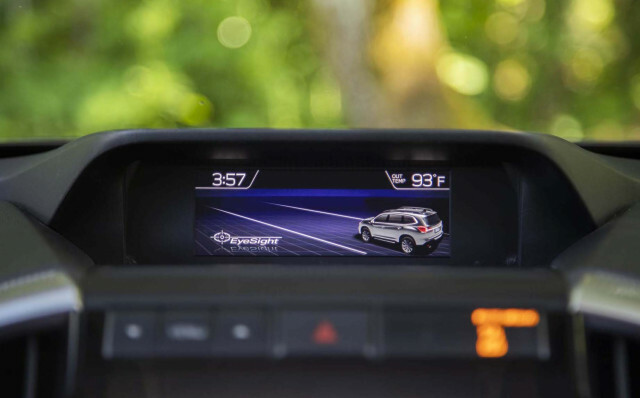 The 2019 Ascent is standard with Subaru's suite of active safety features, called EyeSight. On every model, forward-collision warnings with automatic emergency braking, active lane control, and adaptive cruise control are standard. 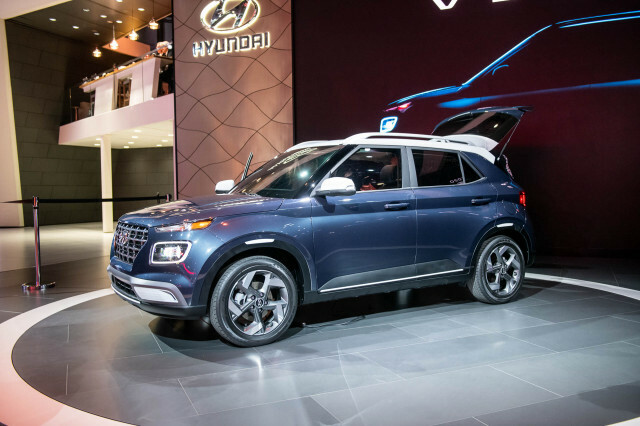 Premium and higher trim levels add blind-spot monitors, rear automatic emergency braking, a forward-facing camera, adaptive headlights, and a rearview camera-based mirror.